Traits: Daemon. Black Legion. Elite. Want to build a deck using this card? Check out the Warhammer 40,000: Conquest Deck Builder! This is a powerful unit and with Flying it will be sticking around a while. True, the high cost is a bit of a drawback, but as a daemon unit you can use Cultist tokens to help reduce its cost. this thing cost 8... is ever it hits the table it should clean up, but it costs 8... not sure what to think of this one, time will tell if its insane or if you have to be insane to play it. Biggest and best unit in the core set, but also the most expensive. 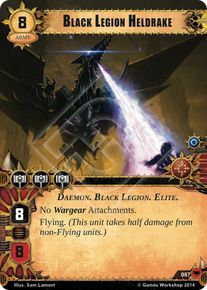 Other "super units" like the Goff Nob, Ultramarines Dreadnought, or Black Heart Ravager cost "only" 5-6, and while this is better than those units it's not clearly 2-3 resources better on cards that are hard to play to begin with. Time will tell whether this is too expensive to see regular play, but I'm optimistic. No, just no. There's already way too many tricks to deal with single targets for you to put all your eggs in one basket like this. Maybe further along the meta there'll be ways to force the enemy warlord to engage with this beast, and we'll have some chaos-based assassination deck. Right now, if you drop this in First Planet (and where else would it go) you're basically giving the rest of the deploy phase to your opponent and surrendering all the other command struggles. You can't even do this on turn 1 because of the cost. The existence of this unit makes everyone consider carefully whether or not to trigger the battle ability of Y'varn when playing against a Chaos warlord. I have managed to play this card several times as chaos. most of the time just mass sacrificing cultists. Once it hits the table it becomes the unit to fear and your opponent will go above and beyond either committing a lot of resources to kill it or try to use an effect that kills it outright (which at this point can be played around). As for whingewood's comment earlier. When I have this unit in hand I always trigger the abillity of Y'varn. I do so because currently in the meta (at least mine) people do not like running expensive units like this. I cant tell you how many times I have triggered this ability and all they get is a goff boy or a void pirate. it comes down to how many cards do they have in their hand. More like no matter how big a unit you drop, Chaos will always drop something bigger. Can't give this more as a 3/5 now. For sure it's fantastic and wins most combats but at the same time it costs a whoping 8, so if it costs more than your initial resources, I guess it should win you the game... Something it doesn't do perse. But with the likes of Y'varn can be done. Reliable, resilient, deadly. And three command icons on top of that. Isn't that easy to deploy (apart from Y'varn), but doing so ensure a combat match worth fighting. Still prone to exterminatus and doom. Get the AOE chaos unit instead, multitudes better. Maybe have 1 in the deck, I couldn't find room for it though. Commit to the planet where you can put a unit into play. Problem is, is that there are so many ways to deal with.. Fury of sicarus, archons terror, routing, exhausting, or even a beefed up orc unit with no flying keyword. A friend of mine and me have been trying to fit this into his Chaos/O deck, along the other high-cost Chaos units. We have come to the conclusion that it can work on casual games. But once you try to go competitive, it doesn't work... yet. The thing is, this card cost too much, and it's still a single unit. It can be tapped, it can be routed, it can be killed, just with one card. Your are spending 8 on a creature that most armies could try and deal with. Of course, it puts a lot of preassure in your enemy, but as do to you, as you are spending 8 resources to put it on the field. And, ok, let's say that it doesn't get nullified by those cards. You'll hit once, and then stay like that for a whole round. If this is your only unit on that planet, it can get wrecked if the enemy have like, 3 or 4 troops on that planet, or ways to enhance it's damage. So you don't want to play it on a planet alone, you want it to be supported by lesser units. Even if the enemy have no troops on that planet yet, they'll either be able to play a lot of other units on it, or just ignore it. So you'll want to play it either on a planet in which you already have some presence, or on a planet with few enemy presence, and when the enemy have few resources. So, you'll want to play this card when you are already winning. Because if you have presence on a planet, and 8 spare resources, you could play 2-3 units instead, and that'll mean that you are already winning (in some way). If the enemy have few resources, no units at an important planet, and you have 8 spare resources, you are already winning. So, this unit work when you are already winning, and is still vulnerable to remove cards. If you play this when you are already winning, and now get hit by one of those cards, you lost your advantage. This could be extended to other expensives units, more or less. Expensive cards have no real way to reduce their cost (you can't get enough cultists right now to them be reliable), and are really vulnerable to removal or swarming. I think right now, big, bulky units aren't worth it on a competitive level because they don't have enough tools for them to be played while not already winning. Right now, I think this card is 3/5, because even all that it's still an 8/8 with flying. But I'm pretty sure in the future they'll be more playable. The Elites issue has been discussed long. They can be controlled like any other army units in the game, but if the opponent has no tricks to deal with them (or more commonly, has already used them) that same turn, the planet is yours. Routing is also overestimated. The Helldrake will be back next turn. That kind of resources are limited in a deck, and a warlord cannot face a Helldrake himself by any means. But the thing is, an elite THAT expensive will only attack once. As I said, if you have a big elite, and lesser units to support and kill the other stuff, you were already winning before deploying the elite. You could have accomplish the same thing with 2 units, which are more reliable. The real thing here is resources vs cards. Elite allow you to spent less cards, while smaller units allow you to spent less resources. Right now, I think smaller units work better, and there is not a real "reason", competitively speaking, to need to spent less cards. Maybe in another faction... 8 resources is huge. But in Chaos is perfectly playable. Costs a lot, sure. But it can snipe a warlord, so its very presence on a planet is enough to keep away the enemy warlord. Very useful towards the end of the game, when there aren't that many places for a warlord to hide, esp. if he's already bloodied. A real game winner in my opinion. Usually it's possible to put together a composition of units for roughly the same cost as an elite that can threaten the elite, so I wouldn't say elites win planets automatically if the opponent is out of tricks. The heldrake is in a better position in this case due to flying, and typically the opponent needs to spend more than you to take it out reliably sans control cards, though there are some exceptions. About routing, the drake still comes in tapped. In most cases it isn't too hard to chew through even the heldrake's defensive in a combat round. Naturally board state is going to be the deciding factor here, as with the right set up even a tapped drake can be just the right amount of extra pressure, but on the other side you may have just lost command hard the turn before and be outgunned with a warlord and an unhelpfully tapped drake. I agree that Elites (false)issue has been discussed long. Usually it's possible to put together a composition of units for roughly the same cost as an elite that can threaten the elite, so I wouldn't say elites win planets automatically if the opponent is out of tricks. This is very rare due to the way that combat turns work. In best case scenario, when you have the initiative you need to destroy the elite with one of your 2-3 cheaper units, because then the turn of attack is for your opponent, and his elite probable 1hit-kill you any of your cheaper units, or even your warlord. Thats why you need tricks to deal with the elites. (In addition, he probably have more things than just an elite). In the particular case of the Helldrake, except Klaivex (one attack that deals real dmg to flying + shields, and then 4 gold) or sicarius fury (2 cards in entire game), nothing can kill it in 1 hit. Thats enormous in this game. Without tricks for exhaustion, ranged attacks, boosters, or something like squiggify, a single Elite can win you the planet, and probably the game. Without the resources to deal with Elite units, this game would become nonsense, with all playing just elites and nothing to do to stop them. It would come down to initiative drake vs destructors, and also a single shield would guarantee victory for the drake. Like I said, it's in a better position than many other elites in this regard thanks to flying. A snotling attack is bad news for the drake, but unless more swarm cards like that come out then it usually takes more resource to remove the drake than it costs the chaos player to play it. This is a good thing, since the heldrake has a decent chance of being a completely dead draw if you don't happen to have the income/cultists needed to play it; a 2-4 cost unit doesn't have this problem. All I am saying is that putting an elite on a planet does not ensure victory if the opponent doesn't have control cards, even for something as mighty as the heldrake. Atrus- I'm not sure I understand what you're saying. So what if the drake can 1hko your weaker guys (the warlord is another thing, admittedly)? The fight doesn't end at the first round. To use an extreme example, if one player double snotling attacks versus the drake, it doesn't matter that a snotling gets annihilated when the drake attacks, the drake is either dying or running away every time, and for more resource (how much more depends on the planet where the fight is at). Exactly as you say, Johnny5, which is why I went with "probably". Initiative or a single shield will have the Heldrake win. No amount of shields will help the destructors! Of course, I should add, that while I'm advocating strongly for this card, I currently don't run it. I run 1x or more in pretty much every chaos deck I play, but I don't tend to play in competitions and have always had a soft spot for big beefy units in card games.